Set and fix the top and bottom pivot pins, offsetting them 34 mm inwards from the door face and at x = 55mm from the side wall. Note: When fixing the pivot base, use screws with a head diameter of not more than 8 mm. Use a Philips screwdriver and the adjusting bolts to insert the pivot socket slides in the connectors about 20 mm. Move the sockets outwards and fasten the socket fixing screw. 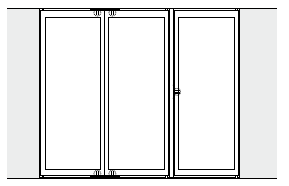 Put the door upright so that the connectors with pivot sockets are aligned with the axis of the fixed pivot pins. The door should be in an open position. While turning the adjusting bolt, slip the bottom pivot socket slide out so that the socket is aligned with the pin and the door lifts slightly. Then slip out the top sliding pivot socket so that it is aligned with the pin, allowing for minimal play. 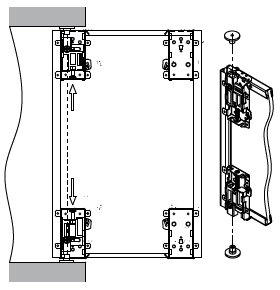 Exercise special care when installing doors. This operation should be performed by two persons. 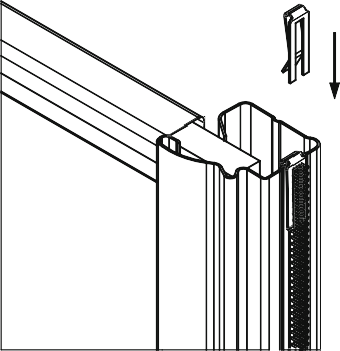 Using a Philips screwdriver and adjusting bolts in the top and bottom connectors, adjust the door height. 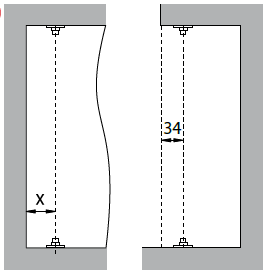 The door-to-floor/ceiling distance is adjustable between 3 and 20 mm. Having installed the doors, remove safety backing from the door profiles. With the backing removed, you can fix the buffer strips. To ensure good adhesion of the strips to the profiles, gently clean the profiles with alcohol or white spirit. Fix the strips, working your way from top to bottom. Cut off excess strip. Having adjusted the door, close it, place the magnetic latch at the door leaf, mark the position and open the door. Fix the magnetic latch to the floor / ceiling / wall.